A group of 18 belly dancers dodged the weather and shimmied their way around Morgan County yesterday. 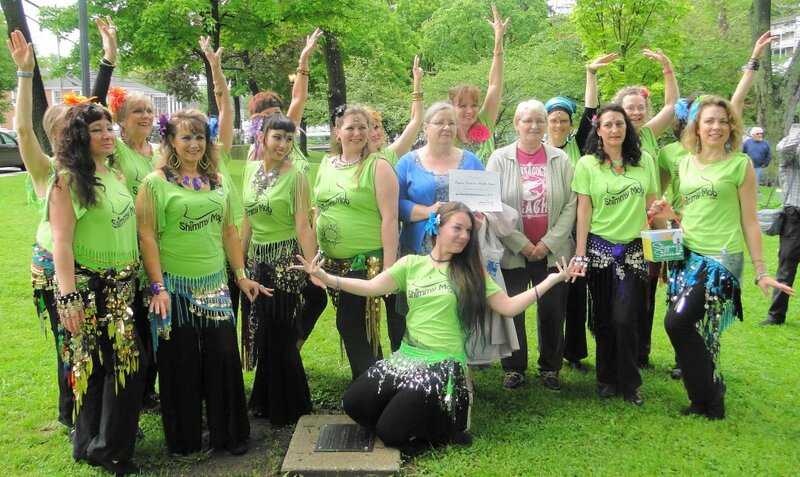 The belly dancers, organized by Angela Petry, founder and instructor of Bellysima Bellydance, raised more than $2,700 for Stepping Stones to a Brighter Future, a Morgan County charity set up to assist survivors of domestic violence. Local businesses and individuals sponsored the dancers — and people gave cash donations after each performance throughout the county. “It rained throughout the day, but every time the dancers took to the streets, the skies seemed to lighten up,” Petry said. The belly dancers shimmy mobbed the Morgan County Master Gardener’s Plant Fair in Berkeley Springs State Park, the County Courthouse, Earth Dog Cafe, Berkeley Springs High School, Ambrae House, the Star Theater, and the Troubadour Lounge.